“The truth of the matter is that we are a part of something much bigger than ourselves; and what we do, how we live, how we understand and make our choices has a great and lasting effect on much more than just ourselves,” said Father Frank Kaminski, staff member at the Jesuit Center for Spiritual Growth, Wernersville. 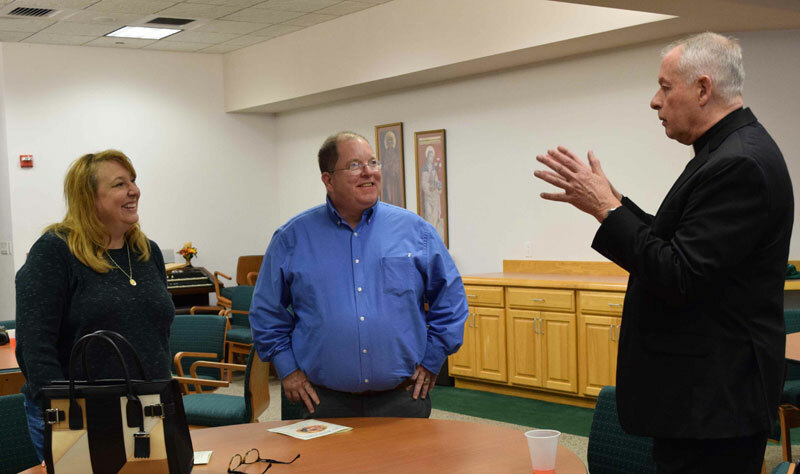 Father Kaminski was the main presenter Oct. 19 for “A Call Within a Call: Finding God’s Will in the Mundane,” at McGlinn Conference and Spirituality Center, Reading. “We are reflecting tonight on ‘the call within the call.’ That is the deeper call that God is making to us continually. God’s deepest desire for us and for all of creation,” he said. Father Kaminski shared his story about shortly after graduating college, he told his father that he wanted to become a Jesuit priest and not a doctor like he had hoped for his son. “Like any caring parent he looked beyond his own disappointment. He looked at me and brought himself to say that bottom line desire and hope that all parents have for their kids. ‘Well, as long as it makes you happy,’” said Father Kaminski. “This is the bottom line desire that we all have for ourselves and for those who are close to us. All of us want to find happiness, joy, peace, contentment, fulfillment, love, connection, or whatever other word that best describes our aspirations, hopes and dreams as we take up this adventure we call life. Yet, happiness is one of those illusive things. It comes and goes. It slips so easily through our fingers and out of our grasp,” he said. Father Kaminski pointed out that people tend to get hung up on accomplishment, live life as if it were a job and perceive God as the chief operating officer of the universe. “But that’s not really how it is. God is not an engineer building a world out of a precise set of blueprints, and we are not simply created to get some job done for him. God is more of an artist than an engineer,” he said. The creation of humanity, according to Father Kaminsky, is a special point in the ongoing creative action of God, and something special happens in the creation of human beings. “Now there is a part of creation that is not just a passive expression of God’s majesty, but an active participant in what God is doing. It is our consciousness that permits us to join God in freedom in God’s creative action and work. We are not an end product. We are part of an action which continues into an unknown and, for us, an unimaginable future,” he said. As beings who are self-aware, with intelligence and freedom, Father Kaminski said, humans are given the possibility of doing what God does in a unique and Godly way. “We are joint creators of an ever-fuller expression of divine life and love, the essence of the God life, which finds its fullest expression in the risen Christ – the perfect ‘material’ expression of divine life and love,” he stressed. “This is what causes us to wonder and marvel at who we are, what we are about, what our life means, where we are going and what we are to do with what we have been given. We are still an unfinished work. We are still becoming,” said Father Kaminski. He pointed out the image of humans as “dust on the ground” in Sacred Scriptures and said many people fail to understand how critical humans are to God’s work. “Many are not especially conscious of the complexity of our situation. Many don’t see God particularly involved in our day-to-day existence, and many don’t see how intimately and intricately we are involved in God’s creative and salvific work,” he said. “Many tend to view their lives as independent agents, free to determine and alter all the aspects of human life according to our perceived needs and desires. In addition, he maintained personal freedom and individuality is not given to humans so they can do whatever they want. “Understanding who we are, our freedom allows us to be free, creative agents collaborating with God in his magnificent, universal work,” said Father Kaminski. Although humans tend to become unaware of who he/she is, he said humans sometimes make destructive choices, frequently with no awareness of the damage being done. “God’s desire is always to draw us back to see and to live out of our true, God-oriented nature,” said Father Kaminski. And the way back to God, he said, is through Jesus. “He reveals to us what we had lost and sometimes willfully forgotten – the beautiful but difficult truth that we are made by love and for love – that like, in and through Jesus, we are made to be the material creative presence of love in this part of the universal creative work that is God’s self-expression,” said Father Kaminski. Like Ignatian spirituality and authentic Christian spirituality, Father Kaminski said, humans must be in intimate contact with the spirit of Jesus and are called to be an expression of the Father’s love. “We are called to be Jesus and to be the continuation of who Jesus is and what Jesus does through history and time,” he said. Faithful listen to ways of discovering God’s will in everyday life. 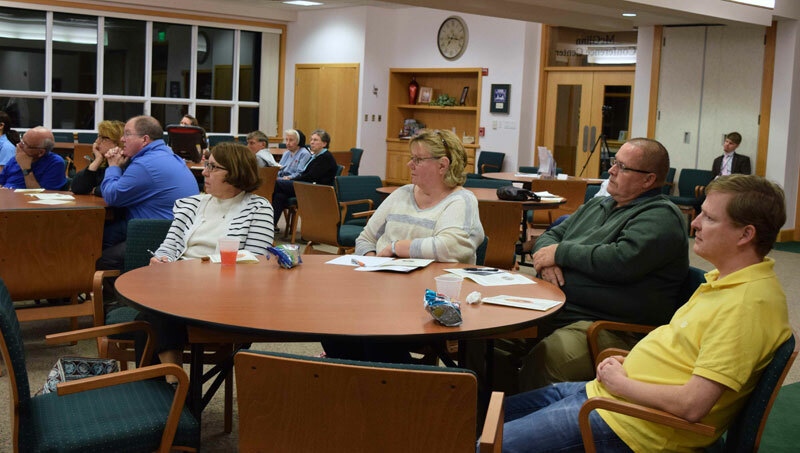 Participants gather for the workshop at McGlinn Conference and Spirituality Center, Reading. Father Kaminski, right, replies to a question from Anne Marie and Tim Ferguson during the break.